I have wanted to try some new-to-me details lately, so I took a foray into Ombre! This vintage French Provincial chest of drawers was beautiful, but had some broken trim at the bottom that we removed, puttied, and sanded smooth. Then I painted the body of the dresser in Annie Sloan Chalk Paint in Paloma, and poured some out into a sealable container. 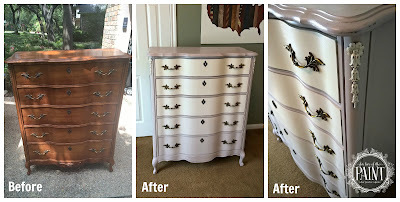 I added about two tablespoons of Old White to the Paloma, blended well, and painted two coats on the bottom drawer. I continued this until I had painted two coats on the top drawer to create a subtle gradation, and used the lightest color to highlight the floral detail as well. I loved the end result!! I also did a small touch of sanding for just a hint at a shabby chic finish. I wanted to preserve the beautiful vintage feel of this chest of drawers. I adore the serpentine front as well! Note: I have seen Paloma described as a neutral taupe / gray color, but I found it to have a cool, almost purple undertone as well. It was beautiful, though, and I'll also be excited to see what it looks like with dark wax the next time I use it! This was a Project Pair with a Bombe style chest of drawers that is using Paloma as the under-layer beneath bold, modern metallics :).